Zooming in and out of the map and establishing 3D views is performed using the controls on the left half of the Google Plugin window or simply with the mouse as you would with Google Earth. 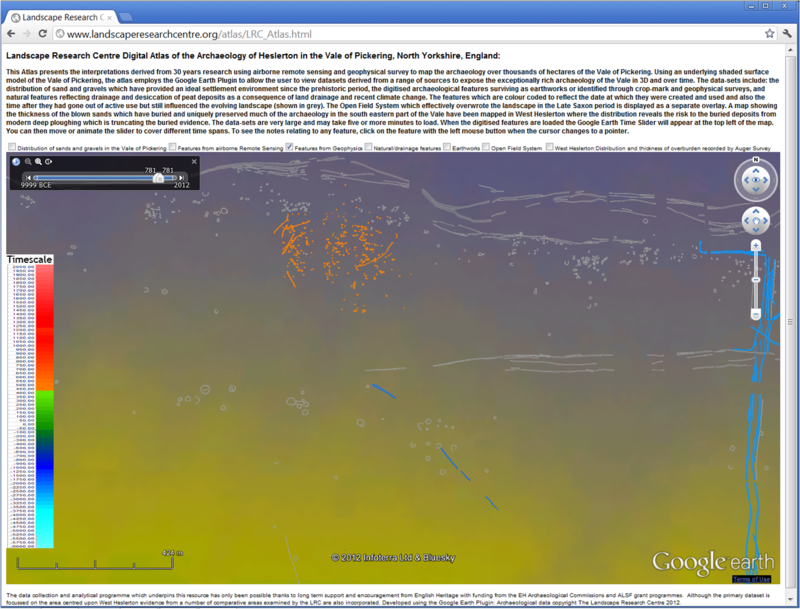 The Z-magnification of the underlying Google 3D model is set to 3. The display of the comprehensive archaeological body of mapped archaeological evidence assembled by the Landscape Research Centre using the Google Earth plug-in represents an innovative approach to making archaeological evidence available on line. The most important innovation is the approach adopted to reflect time; each feature is assigned a start, end and continues until date. This approach allows us to reflect the continued influence of features in the landscape long after the features cease to be in active use and use the slider bars to dynamically show landscape change over time. Features are coloured according to the start date as indicated in the Timescale Key, during the period from when a feature ceases to be actively used but continues to have an active presence in the landscape the feature will be expressed in grey. The Google Earth Time-bar provides a method to show a time slice at a particular date, activity across a time span and to animate through the time sequence. In the example shown below (Figure 1) the date slider has been dragged to 781AD (It is difficult to identify a very specific date given the full range) in this case and Anglo-Saxon settlement active at the time is visible in orange with Roman and Prehistoric features considered to be inactive but still featuring in the landscape showing in grey. The blue track-way on the right is assumed to be a prehistoric track-way that remains active into the post Roman period. Figure 1: The Atlas with geophysical survey results displayed to reflect the landscape in the late Eighth Century AD. The time bar is at the top left of the display. You can use the small + and – icons on the time bar to zoom into the time scale to any particular year (Figure 2) but it must be remembered that the underlying data is, unless set with absolute dates derived from excavations, classified within very broad ranges. The time slider allows you to set an upper and lower date range and thus view all features that were active at any time in the selected range. Figure 3: the time bar set to reflect features thought to be active anytime between 520BC and 608AD and coloured according to their start date. 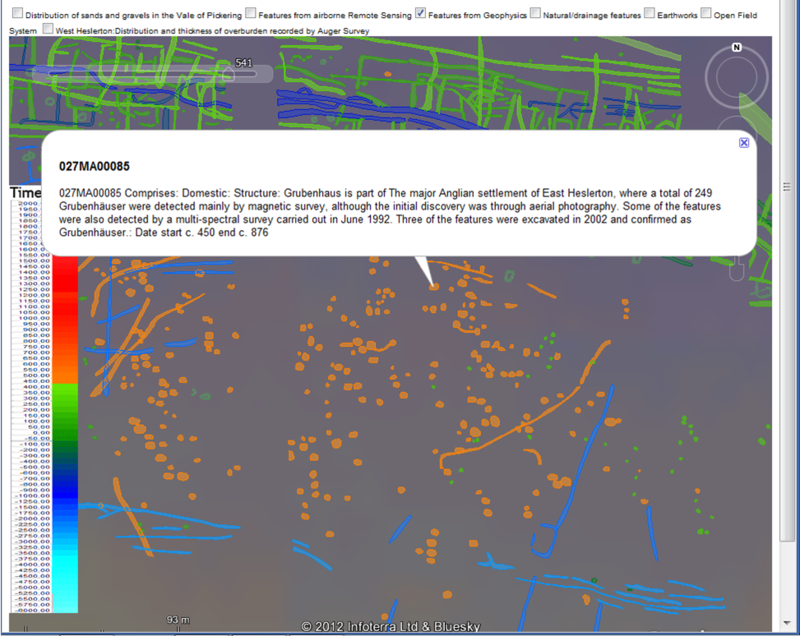 The Atlas uses inbuilt Google Earth functionality to support interrogation of each feature. When the mouse cursor changes from a hand to a pointer a click with the left mouse button should bring up a text window giving a description of the feature and its context. For some reason that we have not yet resolved a problem with this function, when the browser window is opened at full screen width the text window constantly updates and flashes; this can be stopped by reducing the browser window width. Figure 4: A descriptive text box shown be clicking the left mouse button when the cursor is changed from a hand to a pointer. Occasionally a possible server KML read error is reported, this appears to happen if too many data layers are switched on at once and the Google Earth plugin is trying to load multiple data streams at the same time. If internet connections are poor it can take several minutes to load each data layer. If the computer used to view the Atlas is insufficiently powerful or has limited memory and the view covers a large area the performance can be poor, in this case to improve performance you need to zoom in to show a smaller area (the zooming will also be slow) once zoomed in the performance should generally be OK. The system was developed on PC’s with 8Gb of RAM.